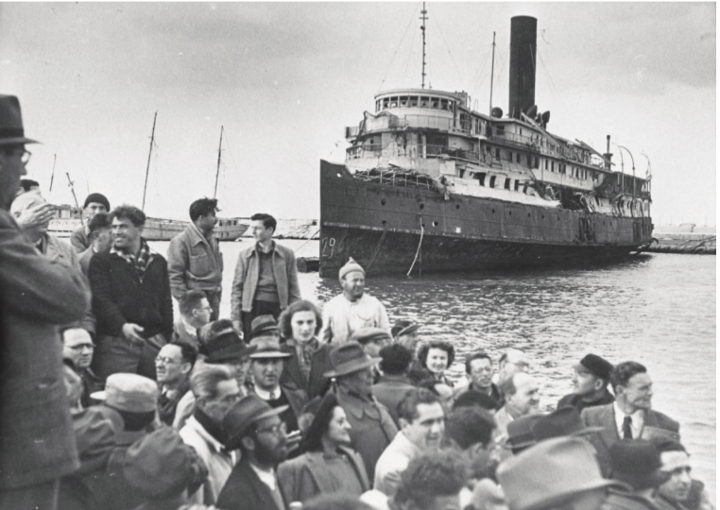 The Palmach, Immigration to Israel. July 18, 1947. Courtesy of the Palmach Archive, via the Israeli Pikiwiki project. The general tendency to conceptualize the study of migration from a homeland to a hostland leading to the formation of cultural enclaves in the country of resettlement is a fruitful framework for most international migratory movement schemes. However, this traditional sociological approach is less insightful when applied to an analysis of the global, multigenerational, and multidirectional Jewish case. The Jewish dispersion is exceptionally multifaceted: it has several points of origin; it has been continuous despite fluctuations in migratory rate, whether a trickle or substantial at times; it occupies urban enclaves, facilitating cross border social reproduction; and it interconnects diasporic sites of resettlement in a global landscape with the ancestral homeland to form a multisite nation, or cosmonation, displaying a variable geometry. A larger conceptualization of immigration that better fits the Jewish example must pay attention to the global ensemble arising from interconnected demographic patches despite the varied modes of formation, organization, connections, and status positions of nodes. In this expansive context, immigration takes on a different meaning; it is an effort by an individual or group to reach out to other segments of the geographically distributed sites of the multisite nation. In other words, immigration is a mechanism that leads to the creation, expansion, consolidation, and ongoing reformatting of the global network, reflecting the architecture of its cross border engagement. This multidimensional form of immigration produces both productive dividends and negative consequences. These outcomes are visible from the scale of the family unit to the global network of nodes that the distributed enclaves compose: for instance, in the multinationalization of the Jewish family-household with members dispersed in different sites if not different countries; the development of diasporic quarters that function as interconnected nodes; the prepositioning of each enclave as a potential or actual place of refuge or settlement for persecuted members from other enclaves and for individuals in search of employment, educational facilities, or the realization of family reunification; the production of knowledge and goods in one site but consumed by the entire network; and the creation of global institutions headquartered in one country but providing services— either directly or through subsidiaries—to compatriots in other countries. The multiple cross border imbrications of these translocal communities allow them to function as a global network operating as a multisite nation, which shows them in a different light because of the ability to map out and understand the cosmonational landscape of their interactions. Migration is a key element that helps us understand the step-by-step mechanisms of re-assembling the human infrastructure of the multisite Jewish nation. It sheds light on the formation of enclaves, the geographical distribution of sites, the directions of circulatory movements, and the agencies that provide social services to both the local communities to which Jewish immigrants belong and the extraterritorial communities to which they are connected. If in-migration is essential to understanding the process of formation of Jewish enclaves, emigration is a sine qua non to deconstructing the process of their collapse. Fruitful insights arise not only by studying the phenomenon of human mobility from homeland to hostland and vice versa, but also from a focus on the linkages between extraterritorial enclaves. In Global Neighborhoods: Jewish Quarters in Paris, London and Berlin (State University of New York Press, 2008), I documented the unmaking and remaking of these neighborhoods of globalization after World War II. Their formation resulted from voluntary and forced migration from the Middle East, the Mediterranean region, and North Africa to Charlemagne's Europe; these neighborhoods served as homes to first and subsequent generations of Jewish immigrants. Over the years, these enclave-communities established unique traditions, religious organizations, commercial establishments, educational facilities, social and humanitarian protection agencies, and transnational ties. Each maintained a distinct identity despite earlier forced ghettoization (beginning with il ghetto in Venice in 1516), which has contributed to the social reproduction of the subalternity of daily life, but aided its social reproduction by a unique temporal structure of religious practice—a lunar-solar calendar that does not coincide with the Gregorian solar calendrical system of the hegemonic Christian West. As a result of this temporal marginalization and subjugation, the Jewish weekly cycle choreographs its rhythms within the interstices of the dominant Western week. Despite their local entrenchment, these diasporic enclaves have always functioned as transnational and global communities, their presence reflected in transfrontier interconnections and familial and institutional reliance on other enclaves in other countries for religious, commercial, and associational reasons. These global forms of operation and cooperation of Jewish enclaves manifest themselves in different ways, including the transfer of rabbis from one site to another in the cosmonational network; the circulation of goods, information, and images from one enclave to another; firm headquarters in one site that have subsidiaries in other enclaves; social agencies established in one enclave that serve the needs of compatriots in others; and the vocation of each site to serve as a potential place of refuge for residents of other enclaves in cases of religious persecution, pogroms, regional conflict, war, or natural disasters. The global networking of sites is seen not only through the solidarity they show toward each other, but also through the competition they exhibit when a site projects itself as the capitol of the network. For example, from the mid-nineteenth century up to the Second World War, Jewish Paris was often referred to in common parlance as "Little Jerusalem," Jewish Amsterdam as the "Jerusalem of the West," and Jewish Vilna (now Vilnius) as the "Jerusalem of the East." Each enclave competed to be the most significant site of the Jewish Diaspora either as a center of intellectual life, a hub of political organizations, or a bubbling site of Orthodox religious institutions. The study of Jewish migration not only allows one to observe the circularity of human movements from site to site, the mutual solidarity of sites, and the contribution of each site to the operation and social reproduction of the global network, but also the role of such sites in the network governance of the cosmonation to minimize perturbations and maximize resilience. By looking at the network in addition to local community nodes, one gains useful insights as one transitions from the logic of individual or group actions to the logic of the cosmonational network, which serves as a framework for understanding the peculiarities of the contributions of each site to the construction, organization, and functioning of the Jewish multisite nation. Michel S. Laguerre is professor of Global Studies, director of the Berkeley Center for Globalization and Information Technology, and member of the executive committee of the College of Letters and Science at the University of California, Berkeley. He has written more than twenty scholarly books; his most recent volume, The Postdiaspora Condition, was published in 2017 in the NYU European Studies Series.